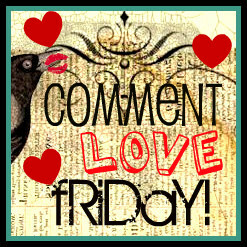 SusieQTpies Cafe: Comment LOVE Friday! Ok friends time to show some comment love! Do you have a low entry giveaway, a great post with little to no comments or how about a review that you want noticed? What about a cool craft project or a tasty recipe you want to share but no one is stopping in to see it? If this is you then Comment LOVE Friday is for you! Are you needing more twitter, Facebook or GFC followers? Whatever the case this is your spot. *Just link up as many post from your blog that needs some comment love. *Visit as many links as you added and show some comment love back to other bloggers. So if you add one link, visit and comment on one, two then do two. *If you don't have a blog, join in the comment love and visit the listed pages. *For this to work, you actually need to commit to linking, visiting and actually leaving a comment. Each week I'll pick someone who linked up to cohost! Please leave a comment below if you are interested in cohosting. This weeks cohost is Social Studies Momma! Stop over and give her some comment love! Happy Friday! Go spread some LOVE! I will select one person to cohost with me next week! So leave a comment if you want to be considered! Thanks for stopping in, Allison! I'll be over to your farm soon! Ohhhh, adore your link ups! Thank you so much and Happy Autumn to you! !